This terse Danish thriller is many nautical miles away from last year’s similarly themed Captain Philips. No swelling orchestral score to drag you along emotionally, no heroic action beats or daring last minute rescue by the American navy. A Hijacking, instead of offering pure escapism, treats us to an intense game of brinkmanship while giving us insight to the lives that are at stake. It is a tense slow boil thriller that feels at times almost unbearably realistic. The cargo ship MV Rozen is hijacked by Somali pirates in the Indian Ocean. Shipping company CEO Peter Ludvigsen (Soren Malling) is an expert in the art of playing hard ball and ignores advice. preferring to carry out the ransom negotiations with the pirates himself. 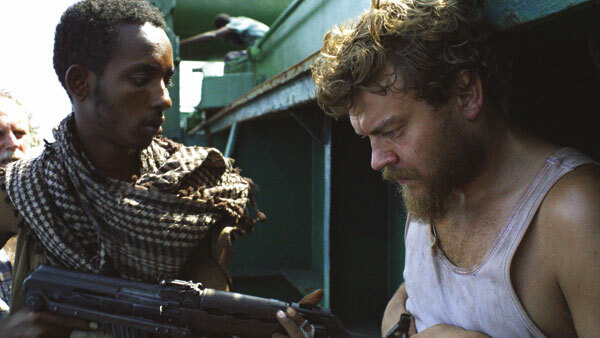 Meanwhile Mikkael (Pilou Asbaek), the Rozen’s cook, must learn how to survive under the hijackers’ regime. As the haggling draws out, the weeks take a toll on both men’s psyche. There is more than a slice of vérité in writer/director Tobias Lindholm’s (Borgen) work. He makes some brave choices in his portrayal of events that pay off – for example, the key sequence of the hijacking is seen from the shipping company’s perspective as an irregularity in the ship’s speed and position as reported by GPS. From here it cuts straight to Mikkael and the chaos on the ship as armed intruders make demands in a foreign language (that is never subtitled), and become increasingly agitated as the demands are not met. It is tense, disorientating and disturbing. In A Hijacking’s realistic world the stakes appear strangely magnified, as the audience acknowledges that its conventional understandings of story are not in play here and reality can be brutally uncaring. Lindholm delights in his setting, almost making the Rozen a character. The shipboard scenes revel in their sense of claustrophobia, always appearing crowded with all the actors crammed tightly in frame. Even on deck, the camera almost always finds a bulkhead or a railing to frame the shot in. Like the crew of the Rozen, we are never treated to a sense of freedom. This claustrophobia is carried over to the boardroom negotiation. Peter is boxed into a small situations room, with information splashed on the walls and whiteboards. Both men are obviously prisoners of the situation. Soren Malling’s Peter is controlled and confident, although as the situation drags out we see his nerves fray. Pilou Asbaek’s portrayal of Mikkael, however, is heartrending. As he is manipulated as a bargaining chip, you can see his posture change as his shoulders slump and his gaze becomes fixed. His character truly loses hope and Asbaek conveys this with chilling effect. A powerful thriller, A Hijacking raises the tension early and keeps it on a slow simmer for the entirety of its run by never stretching the bounds of believability. Its strong sense of veracity makes for rewarding viewing. A Hijacking screens as part of the Lotterywest Festival Films season at Somerville from January 20 – 25 and Joondalup Pines from January 26 – February 2. For more details, head here.